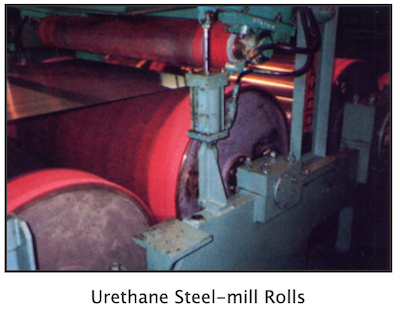 Universal Urethane has been an industry leader in refurbishing rolls for steel and aluminum mills and service centers. We have developed special materials to increase co-efficient of friction while increasing wear and physical properties. Our blocker rolls are formulated to withstand abuse and most importantly handle coil weight without covers delaminating. Our coater rolls are ground to customer specifications including 40-60 RA finish. These rolls are formulated to have high wear properties to cut down on changing rolls. 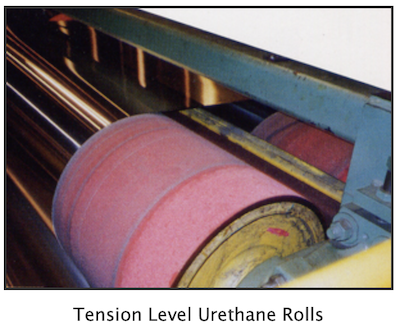 Universal Urethane has developed an ether based material specifically for squeegee roll applications. This material has been found to outlast standard rubber squeegee rolls by up to 10 times greatly reducing down time and bearing replacement costs. We have developed standard coverings for tower rolls designed for long life and we have premium coverings for rolls that have chemical carry-through. Our cell rolls are made from a specific formula for warm electrolytic water typically found in this application. Our holds down coverings are designed for heavy abuse and they are made to resist delamination from overloading or line malfunctions. We have formulated print roll covers with durometers from 20 shore “A” to 70 shore “A”. RA finishes from 40-120 available. Our pinch roll coverings resist cuts and chunks. They offer heavy pinch without delamination of the covering. Rolls are size matched to prevent different speed and feed problems between the rolls. Receive roll with all bearings, housings, and frames attached. Remove, clean, and straighten frames. Remove bearings, housings, and seals. The housings are inspected and repaired if needed. Completely inspect roll and shaft. UT and mag particle test roll and shaft. Any needed repairs are quoted at this time. A report is supplied for the UT/Mag testing. Recover your roll and finish per print. Replace bearings, seals, and housings. Bearings and seals are supplied new or re-conditioned. The roll is now ready to be replaced into service without added cost or time incurred by your employees. A wide variety of surface finishes, groove patterns, and roll profiles are available from Universal Urethane. Depending on how a roll is used and the area that the roll is used in, any combination of the following finishes can be used.